ViewSonic has been competing fiercely in flatscreen TVs for some years now, but the company hasn’t quite forgotten other components of the home theater market: the company today announced its new Pro8200 HD projector, offering 2,000 lumens of brightness, a 7-segment color wheel, and dual HDMI inputs for a suggested retail price of $999. ViewSonic hopes the Pro8200 appeals to both do-it-yourselfer home theater fans as well as professional installers and folks looking for an HD projection solution in halls and other facilities. The Pro8200 supports full 1,920 by 1,080-pixel (1080p) high-definition resolution via two HDMI 1.3 inputs (and those support HDCP content protection). 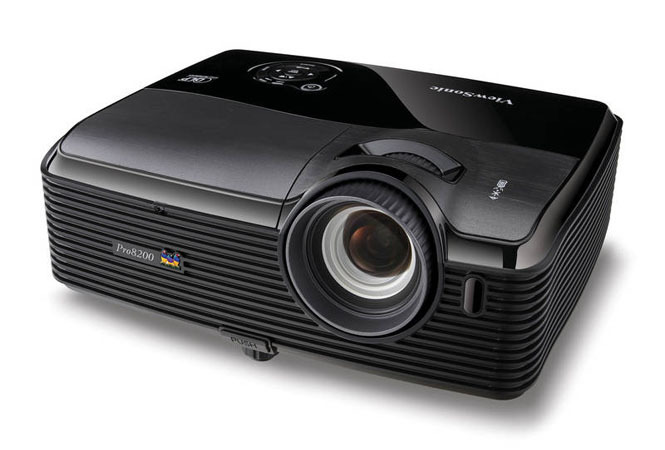 The Pro8200 offers 2,000 lumens of brightness, and while ViewSonic isn’t consistent about the 8200Pro’s contrast ratio (some specs say 3,000:1 while other specs and press materials claim 4,000:1), the unit can handle 70 percent of the NTSC color space. The Pro8200 also packs composite and S-Video inputs, a USB port for firmware updates, two 10 watt speakers (and 3.5mm and RCA audio output for pushing audio to a bigger speaker setup), along with RS-232 for use with automation systems. The Pro8200 can handle projected sizes of 30 to 300 inches—that’s a display over 7 feet across—and throw distances from 3 to 32.8 feet, plus the the system sports a 5-segment color wheel (RGBWY) with BrilliantColor technology, and Pixelworks PW820 video processing to image quality. ViewSonic says users can expect about 4,000 hours of lamp life, and that can extend to 6,000 using an Eco mode (which also lets the unit run a bit more quietly). ViewSonic says the Pro8200 is available now for a suggested price of $999.